With just three minutes of the home game against Liverpool remaining, Jόhann Berg Guðmundsson scored his first goal of the season to bring the Clarets level, but a goal deep into stoppage time condemned us to defeat on the first day of 2018. There was, at least, no controversy over the goal this time. Arsenal snatched victory against us with a stoppage time penalty five weeks ago while just six days prior to this game we were leaving Old Trafford having seen Manchester United score in time added on to earn a draw, both goals coming following decisions that, based on what I’ve seen this season, we would not have been given. More than the other two, I think, this one really flattened me and I was very subdued leaving the ground and for much of the rest of the day. 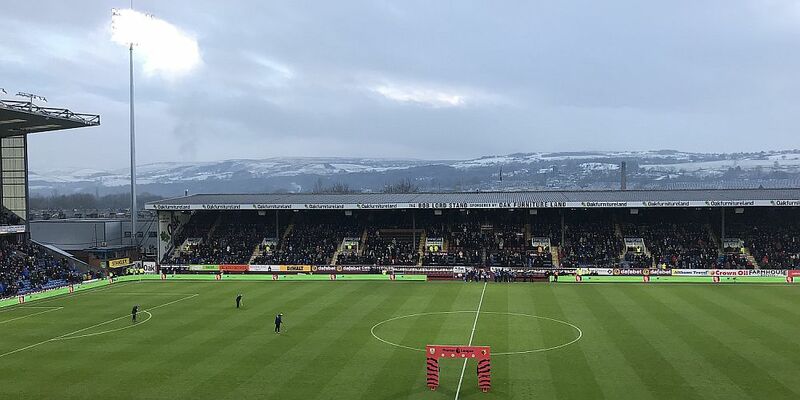 After the fireworks and celebrations of the previous night (or Jools Holland for those of us feeling sorry for ourselves with colds), 2018 was greeted at Turf Moor with another drop in temperature, strong winds and pouring rain. It suggested we wouldn’t get a classic, and we didn’t. Some managers moan about the fact that we play too many games over the festive period, others just get on with it. Make your own minds up but Jürgen Klopp made seven changes to the Liverpool team that had beaten Leicester while Sean Dyche made just one, that bringing a return for James Tarkowski after the completion of his three match ban. The good news as the game got underway was the wind wasn’t blowing the rain into our stand so I was at least able to keep dry. The not so good news was that we didn’t start very well. The first few minutes were difficult to watch as Liverpool took charge although they thankfully didn’t create anything of note. Adam Lallana, who was back in the Liverpool side after injury, had their one real opportunity but, eventually, we started to come more and more into the game. Ashley Barnes fired wide from a tight angle and then Guðmundsson almost got on the end of a ball through from the striker, only to be beaten by a Lallana challenge. We were certainly in the ascendancy as we reached half time and Scott Arfield was so close to opening the scoring not long before the break when his shot along the ground went just wide of the post. No goals in the first half but by half time we were looked more than comfortable, more than a match for this Liverpool team and it left the home fans believing we could go on and win the game in the second half. We might not have looked as though we were going to grab the game by the scruff of the next after the break, but we looked more than comfortable and with an hour gone I was beginning to believe the worst we would get was a draw. Liverpool were offering very little but then they got that bit of good fortune you sometimes need to get themselves in front. There was no good fortune with the way Sadio Mané scored the goal, that’s for sure, it was a superb finish. The good fortune came in how he got the ball in the first place. Jack Cork lost out to Alex Oxlade-Chamberlain just inside the Liverpool half and the former Arsenal fan got the ball out to Trent Alexander-Arnold on the right hand side. His cross would have been harmless but it took a big deflection off Charlie Taylor to help it into the path of Mané who had his back to goal. He turned to his left and fired in an unstoppable shot into the top corner. You certainly couldn’t doubt the quality of the finish. We’d less than half an hour to come back but we lost our way for a while and Liverpool could easily have doubled their lead although they didn’t really test Nick Pope too much other than a long distance effort from Alexander-Arnold that he tipped wide. We survived that spell and then went looking for an equaliser and we really did give it a good go. Liverpool were wasting time to such an extent I’m surprised they didn’t really have anyone spoken to about it. We pushed hard but it looked as though it was all going to be in vain until the 87th minute when we got our equaliser with both of our two substituted involved. A long kick from Pope was headed on by first sub Sam Vokes. Second sub Nahki Wells chased it and forced Liverpool to give away a throw on the left side. Taylor took it, got the ball back from Cork before crossing. Vokes’ flick on found Guðmundsson coming in at the far post to dive in and head home. We’d done it. Surely now we’d got a point against Liverpool, just as we’d done at Anfield. Four extra minutes had been added and we’d got through over three of them when it all went wrong. Steven Defour took a kick at Emre Can. The German midfielder got through that but then went down in a challenge with Phil Bardsley and this time referee Roger East gave the free kick. It was in a central position and all they could do was hoist a ball into the box but, unfortunately, that’s all that was needed. Central defender Dejan Lovren won the ball in the air and headed towards goal. It does look as though it is going in but his defensive partner Ragnar Klavan made sure with another diving header. It had happened again. We’ve benefited from late goals this season against Spurs, West Ham and Stoke but when it goes the wrong way for you it really is a sickener and so the points went Liverpool’s way. If you want to be negative, we have now gone five games without a win, but if you are realistic you can see we’ve picked up three away draws with the home defeats against the teams currently fourth and sixth. Spurs might well have been too good for us on the day but this Liverpool team, albeit without Philippe Coutinho and Mohamed Salah, were not and with just a bit of good fortune we would have got something from it. If you really want to be negative and be concerned, even if West Ham win their game in hand we will still be 15 points clear of the relegation zones. If you want to be totally positive you could look at catching the 25 point deficit we have against leaders Manchester City. But if you want to be realistic, we are seventh and doing very well and we are getting some of these big teams out of the way. Embed from Getty ImagesIf only we could have hung on, but we didn’t and that means, like 12 months ago, the year has started with a 2-1 defeat. Now I just need to get this damn cold sorted and look forward to being among around 7,600 Clarets at the Etihad for the FA Cup. Burnley: Nick Pope, Phil Bardsley, James Tarkowski, Ben Mee, Charlie Taylor, Jόhann Berg Guðmundsson, Steven Defour, Jack Cork, Scott Arfield (Nahki Wells 86), Jeff Hendrick (Sam Vokes 71), Ashley Barnes. Subs not used: Anders Lindegaard, Matt Lowton, Kevin Long, Ashley Westwood, Jon Walters. Liverpool: Simon Mignolet, Trent Alexander-Arnold, Ragnar Klavan, Dejan Lovren, Joe Gomez, Emre Can, Georginio Wijnaldum, Adam Lallana (James Milner 86), Alex Oxlade-Chamberlain (Joel Matip 90+6), Sadio Mané (Roberto Firmino 72), Dominic Solanke. Subs not used: Loris Karius, Andy Robertson, Ben Woodburn.